This post (including a joint open letter to ASTM from Robin Sutcliffe – chairman of the UK Play Safety Forum – and me) is a direct plea to put this proposal on hold pending a wider review. The proposal – to tighten up the impact absorbency thresholds for playground surfacing – may sound purely technical. In fact, it is far more profound, as my regular collaborator Bernard Spiegal has argued. What is more, it could have far-reaching consequences, potentially leading to hundreds of millions of dollars of additional expenditure by schools, municipalities and others, the removal of equipment, and widespread playground closures. Its effects could be felt far beyond the USA, given the global push to normalize product safety standards. For this reason Robin Sutcliffe wrote to ASTM in December 2014 on behalf of the Play Safety Forum. The letter asked ASTM not to scrap the proposal altogether, but to put its plans on hold, and to carry out a comprehensive, transparent review with input from a wide range of viewpoints. ASTM has so far ignored the Play Safety Forum’s call for a review. Meanwhile, concern continues to grow. The call has been endorsed by BSI, ASTM’s sister organisation here in the UK. It has also been echoed by Jay Beckwith, a leading American playground expert with experience on ASTM’s playground safety committees. All is not lost: the standard has yet to be published, and there is a brief window of opportunity prior to an ASTM appeal hearing on 4 March 2015. Hence Robin and I have written another letter to ASTM (I am an adviser to the Forum). This time we are sharing it publicly, to open up the debate and encourage those who agree with us to take up the issue. Our letter follows, in full [and there’s a pdf download here]. I would welcome comments, as ever. If you share our concerns, I would also urge you to spread the word now, and to consider getting in touch with ASTM before 4 March. If enough people make a reasoned case, I am sure that the organisation will accept the strength of the arguments. This letter asks you to put on hold the publication of this standard, pending a wider review. It follows our December 2014 letter. We understand that your committees have approved publication, but that this decision has been appealed to ASTM’s Committee on Standards for consideration on 4 March 2015, giving a window of opportunity. While we understand that this Committee normally only examines procedural questions and not substantive issues, we also gather that, as chairmen of the relevant committees, you have the power to delay publication. As you know, our view is that this is a complex topic, which demands proper consideration of evidence and arguments from a variety of perspectives and disciplines. Any decision by ASTM to reduce the Head Injury Criterion (HIC) threshold for playground surfacing would have major implications for playground providers and manufacturers not just in the USA but around the world. Hence we think it should not be taken before a broad, transparent review is carried out, involving a wide range of stakeholders. Concern about ASTM’s current position is growing. Since writing our original letter, we have been in touch with members of your committees who share some of our concerns, and who agree with us that a more in-depth review of the topic is needed. We are also aware of wider concern beyond your committees, in the USA and beyond. Indeed as you may know our earlier letter has been endorsed by BSI, your sister organisation here in the UK. This makes us more certain of the need for a pause in the ASTM process, and a wider review. It goes without saying that every life-changing injury or fatality is a tragedy. Moreover, concern appears to be growing about traumatic brain injury and its consequences, which can be severe or fatal. However, statistics on accidents suggest that playgrounds are comparatively safe places for children, and that traumatic head injuries from playground falls are comparatively rare events. Accident figures from CDC suggest that in the decade 1990-2000, there was on average a single child fatality each year as a result of falls in American public playgrounds. By contrast, almost 1100 child vehicle passengers under 15 died in a single year, and almost 300 child pedestrians (US Dept of Transportation figures for 2012). Looking at recreational contexts, around 700 children under 14 drown each year (CDC). And there are on average 12 fatalities per year amongst high school and college American football players (Am J Sports Medicine). Studies also show that playground accidents rarely result in permanent brain injury. A 2004 World Health Organisation review [pdf link] quotes two relevant studies: one states that 1.7% of school playground equipment-related injuries were concussions, and another suggests that fewer than 1% of injuries in US daycare centres were concussions from playground falls. Moreover, concussions do not always have long-term health consequences. These figures raise serious questions about whether, given the overall goal of tackling child injuries, scarce taxpayer dollars are best spent on resurfacing playgrounds. There are many causes of child accidents and injury, and many possible responses to them. Policies that drive up spending in one area will leave less funding for others. Ignoring this reality – difficult though it may be – is not a sound basis for making decisions or setting priorities. What are the practicalities involved in retesting playground surfacing – in the factory and in the field? We are not expecting ASTM or your committees to have all the answers to questions like these. But we do ask you to recognise their importance and relevance, and hence the need for a wider review. Moreover, in calling for such a review, we are not questioning the technical expertise of your committees. Neither do we doubt that you and your colleagues share our goal of giving children exciting, engaging play experiences while protecting them from unacceptable risk. The truth is that behind this goal lies a complex and difficult balancing act. Only a wide-ranging, transparent review will ensure that we get this balance right for children and families in America and beyond. We are copying this letter to a number of people with an interest in the topic, and also publishing it online, in order to open up the debate. This entry was posted in playground, Public policy, Risk and tagged ASTM, Play Safety Forum, playground, playground safety, Risk, standards, USA. Bookmark the permalink. Hi Tim, my group emails do not work, but I do think that all on CPPF and PSF should see this. They probably will through your normal networks but if not could you oblige? Hi Robin – leave it to me! Bubblewrapping our kids by means of incremental risk reduction is one way to approach playground safety but will it necessarily deliver the desired results? In this post’s open letter, the UK Play Safety Forum asks the American Society for Testing and Materials’ (ASTM) Sub Committee F08.63 on Playground Surfacing to reconsider and open for broader debate a planned major change to playground safety standards. Thanks for the reblog Alex! I happened upon this post (and your letter Robin/Tim) on a seldom used LinkedIn at present, but I am so glad I did. I post with the responsibility returning to me from 1 April for all strateguc play development and play maintenance returning to me after 3 years in the commercial partnership realm. Between 2008 and 2013 I was involved in the government’s push for ‘risky play’ through both pathfinder and play builder projects and funding. Many successful community (and by community I mean child lead) play development projects were accomplished through this gratefully received change in thought and approach to play. As much challenge (that’s fun in the dictionary of kids) as possible with as much safety as needed. Now ‘as needed’ is what’s at debate here! 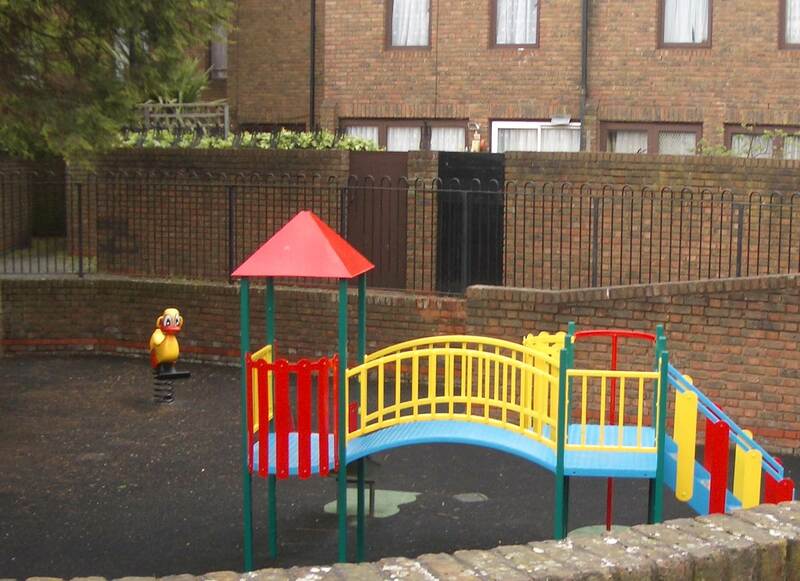 Though my projects delivered I saw a common theme materialising when we looked at old underused play spaces. Most of the investment was in fences, seats, safety matting and dare I saw these utter swear words (wet pour)! No wonder kids were staying home and sitting in front of the xbox or hanging around street corners. We had seriously let all children and young people down by previously developing – out of the box kit designs for ‘safe’ play areas and we’re also allowing developers to destroy play space through shoddy unintelligent design before it was even built or used. I had the great pleasure in meeting Bernard Spiegal for a short course in London and his teachings were a breath of fresh air and rung true with logic and care for children’s overall health and development through play. I sincerely hope that this move is postponed until like you say proper review and consultation is undertaken. If you need any support for the true meaning of play – I would be more than happy to support guys! Thanks for this Chris, and welcome back to the fray. I would encourage you to make direct contact with ASTM – a growing number of people are expressing their concern in various fora, but it’s good if ASTM is made aware. Interesting issue and discussion. I am a CPSI but do not own a surfacing impact tester. It’s safe to say that even my clients who request audits and inspections do not have their surfacing retested, even after years. So what is the point of driving up installation costs when common practice is to ignore the surfacing after it’s installed? Wouldn’t it be wiser to find a way to encourage owner/operators to test the surfacing they already have for compliance with ASTM 1292 as it stands? Thanks for the comment Nina. Actually I personally would also question the need for more retesting, until we have better evidence about the underlying risks and benefits. The broader point is that it is wrong to ratchet up safety standards further until the need is properly made through a transparent, thoughtful review process. We, Greenstone Design UK, support the UK Play Safety Forum in asking the ASTM to reconsider their position via a transparent, thoughtful multi-disciplinary review process. I have just heard that ASTM has put the HIC proposal on hold. The issue has been referred back to the relevant committee, which meets again in May. This is great news, as it will allow for further consideration. It may – I stress may – also pave the way for the broad, transparent review I and many others have been calling for. Thanks to everyone who supported that call. More to come, I hope. While there are challenges that come with a change in standards , financial consideration, playground safety is certainly an important issue to address. Certainly in my experience in Britain and having visited a variety of countries including Germany, Denmark, Iceland, New Zealand, Australia, Norway, Finland, Hong Kong and having worked in Albania and Papua New Guinea the most dangerous play area for young children is a flat open space….they run regardless and then crash into one another. More complex pathways cause them to think as they run. Rubber surfacing also seems to cause them to underestimate the need to prepare their bodies to ‘jump mode’ when they return to hard surfaces resulting in accidents. Risk, challenge and adventure are essential for young children and the future of all our nations. Keep up the brilliant work Tim. PS If anyone is interested my book: Risk, Challenge and Adventure in the Early Years is available on Amazon! Thanks for the comment Kathryn – and for the support. I agree that the behavioural factors in accidents make the picture very complicated. take a break out of your gaming session. informative blog and the very useful blog you have mentioned the blog so well.